Goodreads Summary: Student glass magician Opal Cowan’s newfound ability to steal a magician’s powers makes her too powerful. Ordered to house arrest by the Council, Opal dares defy them, traveling to the Moon Clan’s lands in search of Ulrick, the man she thinks she loves. Thinks because she is sure another man–now her prisoner–has switched souls with Ulrick. I am really intrigued with this series. Things are not going well for Opal, who is now under house arrest after the events of Storm Glass. And let me tell you, things have ended on a really interesting note. Which makes me want to read the next one. I’m really drawn into this world, where there are so many different kinds of magic, and how there isn’t necessarily someone else who has the same talent as you. Like, Yelena has this awesome Soulfinding ability, and so she’s the one who’s helping out Opal when she is convinced that Ulrick and Devlen have switched bodies. And naturally, no one believes Opal until the end of the book, when we learn what really happened with that part of the book. There’s quite a bit of sarcasm, which made me giggle throughout the book, but I also love that there’s a certain sense of darkness in the series. Now that I think about it, there’s a pretty good balance between the two. I definitely want to talk about Opal, who seems to have lost some of the self-confidence she had at the end of Storm Glass. But I still really like her as a character. One of the more interesting parts of the book was her finishing up her studies and wanting to have more of a say in how her glass messengers are used. You’d think she’d be on the committee or whatever, but clearly, that wasn’t the case. But I like that she’s finally taking a stand and speaking up a bit more about them, as she’s the only one who can make them. I still think it’s cool that it’s a way to see who has magic, and that they’re used to communicate. At the same time, I can also understand why people are really interested in her abilities and how people would want control over her glass messengers. You really see Opal struggle with who to trust and no one trusting her, which does explain her behavior throughout the book. She may have been a bit on the whiny side, but it didn’t bother me…because I can totally see why she acted the way she did. You can’t help but get pulled into this world where people make glass messengers and find souls. I think Opal’s an interesting character who has some interesting abilities…and I so want to see how things turn out for her. 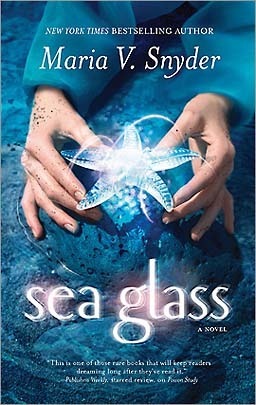 Sea Glass gets 5 stars.